Three generations of men in one Canadian family have one improbable thing in common - their birthday. Kevin Werner was born on 22 September 1959; his son Lucas Werner was born on 22 September 1992; Lucas' son Cooper Werner was born this year on - you guessed it - 22 September. In addition to their birthdays, all three men are first-born sons. It is a coincidence a mathematician said had a one in 130,000 probability, all things being equal. Cooper Werner was supposed to be born on 21 September, but instead he came into the world a day later at 15:04 at the Grey Nuns Community Hospital in Edmonton, Alberta. "The little bugger didn't want to come out then, he wanted to come out the day after," Kevin told the BBC. He said he's used to celebrating his birthday alongside his son Lucas. The occasion even sometimes calls for two cakes - chocolate for Kevin, Black Forest for Lucas. But with Cooper's mother Brianna Ey expecting to go into labour so close to the day, this year's joint festivities were put on hold. "We were all just planning on him, he was the greatest birthday present all of us could have," he said. The odds of all three generations sharing a birthday are steep. The odds of a father sharing the same birthday with his son are one in 365, assuming each day has an equal probability of being the day of the birth. 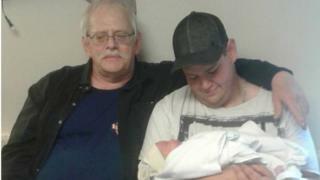 So the odds of a grandfather sharing the same birthday with his son and his grandson is one in 365 times 365, or about 1 in 130,000. Not all birthdays are created equal - according to a Harvard University study of US births between 1973 and 1999. September is the most popular month for births. Kevin's a proud grandfather, but his family's statistical anomaly won't convince him to go out and buy a lottery ticket any time soon, he said. "It's just a bunch of big fat coincidences, I don't believe in God or anything, it all just came together," he said.